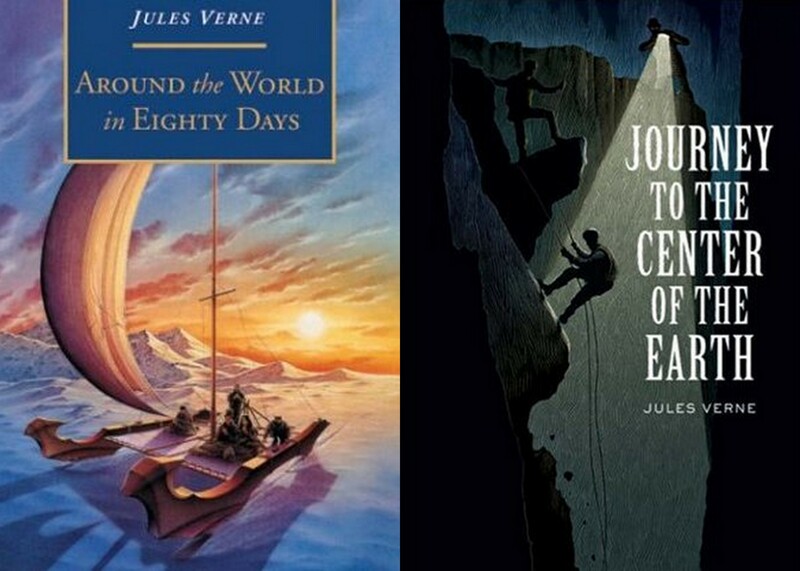 Having enjoyed 20,000 Leagues Under the Sea, which I reviewed a few months ago, I decided to check out two more novels by Jules Verne: Journey to the Center of the Earth and Around the World in Eighty Days. It was my intention to review one or the other for this blog. In one of these novels, explorers venture inside the Earth; in the other, travelers go round it. Since they have so much in common, I’ve decided to review them both. Today, ladies and gentlemen, TMTF makes history with its first ever double book review! Journey to the Center of the Earth—or A Journey to the Interior of the Earth, as my translation was titled—is the tale of Otto Lidenbrock, a professor who discovers a mysterious cipher in an old manuscript. This secret message sends Lidenbrock, his hapless nephew Axel and their stoic guide Hans into the crater of an Icelandic volcano, from which they travel into the heart of the Earth. Around the World in Eighty Days tells the story of Phileas Fogg, a British gentleman whose predictable life is interrupted by the sudden decision to travel round the world on a bet. His servant Passepartout accompanies him, perplexed by Fogg’s wager and determined to help him win it. In the three books I’ve read by Jules Verne—20,000 Leagues Under the Sea, Journey to the Center of the Earth and Around the World in Eighty Days—he seems to create characters by mixing and matching personality traits. Conseil, Hans and Passepartout serve their masters with single-minded devotion. Ned Land, Lidenbrock and Passepartout are impulsive and short-tempered. Conseil, Hans and Fogg are impassive, calm and logical. These characters were engaging enough at first, but they eventually began to feel a bit stale. The farther I progressed into each story, the stronger the sense of déjà vu. I was disappointed by Journey to the Center of the Earth. Like 20,000 Leagues Under the Sea, it has only a few significant characters. However, unlike that novel, its characters aren’t really memorable. In 20,000 Leagues Under the Sea, Captain Nemo gives fascinating hints of his motives and identity. Ned Land begins to crack under the pressure of his underwater captivity. These characters are compelling. In Journey to the Center of the Earth, Lidenbrock is mildly interesting and the others are forgettable. Journey to the Center of the Earth isn’t bad, but it’s hardly more than a sightseeing tour. There is hardly any character development. The plot is simplistic. The novel has no depth. (Pardon the pun.) It’s merely the record of a journey, and—compared to the adventures in 20,000 Leagues Under the Sea—not a particularly impressive one. I liked Around the World in Eighty Days much better. The novel gives colorful glimpses of exotic locations around the world. From India to Japan to the American West, I had strong impressions of the places Fogg and Passepartout visit in their travels. The variety is delightful, and every locale seems authentic. If Verne is guilty of inaccuracies, I didn’t notice. Journey to the Center of the Earth is not an especially exciting book. Its protagonists face dangers, but there is never the slightest doubt they will survive. In Around the World in Eighty Days, however, the protagonists race against the clock and the calendar. They must not merely survive their journey—they must complete it within a time limit. As I followed their travels, I rejoiced with every shortcut and cringed with every setback. The reader is kept in suspense until nearly the very end. If you read only one of these two novels, I recommend Around the World in Eighty Days. I found it much more gripping. However, Journey to the Center of the Earth isn’t bad, particularly as a complement to 20,000 Leagues Under the Sea. These tales of exploration, subterranean and submarine, are worth reading. It’s just a pity the characters in the former aren’t as interesting as those in the latter.